Ashford Castle, located in Cong, County Mayo, has a falconry school on its grounds. 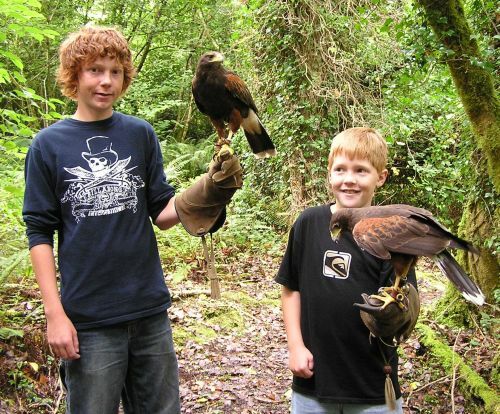 As a surprise for our sons, we arranged for them to go on a Hawk Walk. It was an amazing experience. 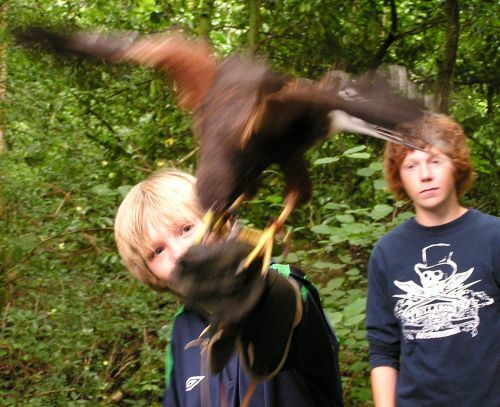 We had one instructor and two Harris Hawks for the three boys. They wore heavy gloves called gauntlets, and took turns holding the birds. The instructor told us about the hawks, and we saw other birds of prey, including falcons. They use the falcons for hunting crows around the garbage dumps. As we walked, the hawks would take off, fly around, then come back and land on the boys’ fists. When they flew through the woods, it was like watching an air force jet doing maneuvers. They glided side to side through branches and flew just over our heads. We passed a large family with several dogs walked down the path the path we were on. The hawks perched on tree branches above us, making all kinds of noise. The instructor said the hawks think the dogs are coyotes, the hawk's biggest predator. The hawks were not happy, and you could hear them up in the trees, hissing and growling quite loudly. Once the dogs were gone, and the hawks calmed down, they flew back to the boys. This was one of the best parts of our trip. If you go, remember to bring backup batteries for your camera to record this great experience.